Reverse Osmosis is a technology used to remove most of the contaminants from water by pushing water under pressure through a semi-permeable membrane. Is the process where you demineralize or deionize water by pushing it under pressure through a semi-permeable Reverse Osmosis Membrane. Reverse Osmosis works by using a high pressure pump to increase the pressure on the side of the RO salt and force water across the semi-permeable RO membrane, leaving almost all (about 95% to 99%) of the dissolved salt behind in the flow. The amount of pressure required depends on the concentration of salt from the feed water. The more concentrated feed water is, the more pressure is needed to overcome the osmotic pressure. PT. 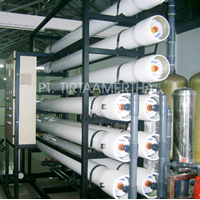 Tirta Amertha sells reverse osmosis which has various sizes of reverse osmosis systems for various applications. A system that is customized for your specific water treatment system or solution can also be built. The system can be a single pass, two passes, custom skid units, portable, and others. Reverse Osmosis is a reverse Osmosis process. Whereas Osmosis occurs naturally without the energy needed, to reverse the osmosis process you need to apply energy to a more saline solution. 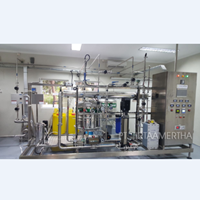 Reverse osmosis membranes are semi-permeable membranes that allow the passage of water molecules but not most dissolved, organic, bacterial and pyrogen salts. However, you need to 'push' water through the reverse osmosis membrane by applying a pressure greater than the osmotic pressure that occurs naturally to demineralize (demineralize or deionize) water in the process, allowing pure water through while holding the majority of contaminants. 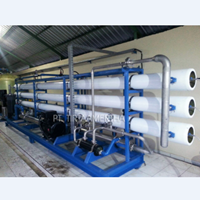 Sea Water Reverse OsmosisFor the processing of sea water into fresh water.Reverse osmosis or RO water filter is a filtration method that can filter various large molecules and ions from a solution by applying pressure to the solution when the solution is on one side of the selection membrane (the filter layer). 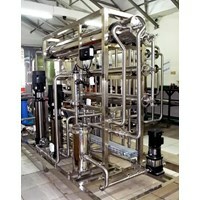 Industrial Grade Reverse OsmosisReverse Osmosis Water Filter System that serves to reduce the metal content in water. Applications for industries with water quality as feed Boiler, Cooling tower, and other equipment. Anda Mencari "Reverse Osmosis RO"? Buat Permintaan Untuk "Reverse Osmosis RO"